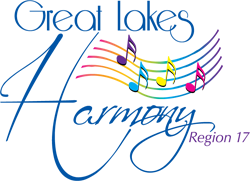 The Grand Rapids Chorus has been reaching audiences in Michigan and throughout the world since 1951. Under the direction of Master Director, Denise VanDyken, the Grand Rapids Chorus is thrilled to be the 2016 Region 17 Chorus Champions and Division AA Champions as well! We look forward to representing the region at International Competition in Las Vegas 2017. The Grand Rapids Chorus is thrilled to be represented all of you in Las Vegas this year as your 2014 Champion Chorus. Thank you from the bottom of our hearts for all of the gifts and love you have given us on our journey! We love you!!! !